Many scientists now believe that we can no longer prevent global warming. We can, however, reduce the impact of global warming and make changes in our individual lives. The more people who become energy conscious and consume our resources less frivolously, the more readily we can reduce global warming. Drive less often. Reduce the amount of gasoline you use. If feasible, purchase a vehicle which gets better gas mileage. Otherwise, look into carpooling, take public transit, and walk or bike to nearby locations. Use power strips in your home or unplug your devices when not in use. A number of devices consume energy even then they are not turned on. A power strip can be used to turn many of them off and on. Simply switch the power strip to the "off" position when you aren't using the devices, and they will stop consuming unnecessary energy. Ask your power company for an energy audit on your home. They can provide recommendations on ways to reduce energy and let you help in the fight against global warming. Begin recycling your garbage by separating it by type into color-coded trash cans. Take them to your nearest recycling center or see if your local sanitation department handles recyclable trash. Ask your workplace if they will institute a recycling program to renew any paper products they use. Check your water heater thermostat and make sure it is no higher than 120 degrees F. Insulate your water heater to keep it from leaking unnecessary heat. Reduce your showers by 5 minutes and install a low-flow showerhead, which requires less energy than a regular showerhead. Cut down on excess packaging and bags. Look for products that aren't wrapped with a lot of unnecessary plastic or cardboard. Bring cloth or reusable bags with you when you go shopping and ask the cashier to place your purchases in them instead of using another plastic bag. Air dry your clothes instead of using an electric dryer. This is especially true in the spring and summer, when the weather is warm and the sun can do the job of drying for you. Install double pane windows in your home and increase the amount of insulation you have. They will help your home retain warm air in the winter and cool air in the summer. If you have a large family, you may want to assign "energy tasks" to each member. Not only does this divide up the work, but it can help increase overall awareness of good energy habits, which helps reduce your bills as well as combat global warming. Do your part to reduce waste by choosing reusable products instead of disposables. Buying products with minimal packaging (including the economy size when that makes sense for you) will help to reduce waste. And whenever you can, recycle paper2, plastic3, newspaper, glass and aluminum cans. If there isn't a recycling program4 at your workplace, school, or in your community, ask about starting one. By recycling half of your household waste, you can save 2,400 pounds of carbon dioxide annually. Turn down the heat while you�re sleeping at night or away during the day, and keep temperatures moderate at all times. Setting your thermostat just 2 degrees lower in winter and higher in summer could save about 2,000 pounds of carbon dioxide each year. Less driving means fewer emissions. Besides saving gasoline, walking and biking are great forms of exercise. Explore your community�s mass transit system, and check out options for carpooling to work or school. Set your water heater at 120 degrees to save energy, and wrap it in an insulating blanket if it is more than 5 years old. Buy low-flow showerheads to save hot water and about 350 pounds of carbon dioxide yearly. Wash your clothes in warm or cold water to reduce your use of hot water and the energy required to produce it. That change alone can save at least 500 pounds of carbon dioxide annually in most households. Use the energy-saving settings on your dishwasher8 and let the dishes air-dry. ©2008 About.com, Inc., a part of The New York Times Company. All rights reserved. Reduce gasoline consumption: For every gallon of gasoline burned, about 20 pounds of carbon dioxide enter the atmosphere. So: bike, walk, take public transportation, or carpool whenever possible. Unplug and strip: Many electronic devices draw power whenever they are plugged into an outlet, even when they are turned off or are fully charged. These energy hogs include adapters that come with rechargeable battery-powered cordless phones, cell phones, power tools, and digital cameras. Electronics that are on standby, such as TVs, cable boxes, and computer monitors, also waste energy. The solution? Unplug these devices and plug them into a power strip. Turn off the strip when these devices are not in use (the strip doesn't draw power). Solarize your cookouts: Make your cookouts solar events by switching to solar ovens. Build your own solar oven or buy one ready-made. Swap Bulbs: Replace incandescent bulbs with energy efficient compact fluorescents, which are widely available in many sizes and shapes. Only 10% of the energy consumed by incandescent bulbs is released as light; 90% is heat. Fluorescents cost more initially, but they last up to 12 times longer and reduce electric costs. Drink shade-grown coffee: Sun-grown coffee is produced in areas of devastated rainforest, while shade-grown varieties help preserve the rainforest, reduce the need for pesticides, and are ultimately beneficial for the planet. Patronize "green hotels": When you travel, stay at green hotels where the owners have programs that save energy and water and reduce solid waste. Audit your home: Get a free energy audit on your home from your gas and/or electric utility and then institute their recommendations. Eat more vegetables, less meat: The average American diet causes the release of an extra 1.5 tons of greenhouse gases per year compared with a strict plant-based diet. Reducing your meat and dairy intake by half can make a big difference. 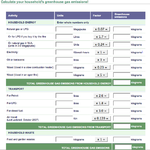 Make saving energy a family affair: Assign each person an energy-saving task. For example, one child can gather vegetable scraps for the compost; another can turn off lights and power strips when they are not in use; and you can use cold water for the wash and hang out laundry to dry. Re-energize your office: Help institute energy- (and money-) saving steps: use ceramic cups instead of disposable ones; encourage double-sided copying; "unplug and strip" (see above); start a carpool; turn down the lights. If you'd like to do even more, you can volunteer with groups that are taking action against global warming, such as the Union of Concerned Scientists, the Natural Resources Defense Council, and StopGlobalWarming.org. This article outlines some ways that you can act to help prevent the Earth from warming further. While humankind has the ability to destroy the planet, we can also help protect and sustain it. Reducing your carbon and greenhouse gas emissions will not only make your personal living space more sustainable but it will save you money in both the short and long term. Global warming is occurring more rapidly than it was originally expected to -- only forty years ago,  the big worry was global cooling. Even if you remain a cynic, however, and believe that the majority of scientists are wrong, you'll benefit from reduced pollution, a more healthful lifestyle and increased savings from enacting these simple activities that will not reduce the quality of your life. Solutions to Global Warming Exist & We Can Make Them Work. Learn More. Learn the reality behind America’s #1 energy source. Hide these ads - Why? Get educated. Educate yourself about global warming. The more facts you have as to what mainstream science says about it, the more you can persuade others to make simple but effective changes in daily behavior. Energy-saving techniques are either initially expensive (for example, solar power), or take extra time (for example, recycling), so many people need convincing that their efforts matter. Always keep in mind that you are aiming to demonstrate the benefits of these activities and highlight how each person can play a vital role in helping to reduce global warming. But don't forget that "[c]ivil society does not respond at all well to moralistic scolding." Use education to enlighten, not frighten. Vote and influence your government with phone calls, e-mails, letters and meetings with those who represent you in government. Learn as much as possible about the policies you advocate before doing so; solving one problem often creates others. For example, replacing incandescent light bulbs with compact fluorescent light (CFL) bulbs has increased the hazard of mercury contamination in homes and landfills. The push to grow corn for ethanol has contributed to higher food prices while saving little energy, if any at all. Choose vegetarian or vegan meals. Livestock are responsible for more greenhouse gas emissions than transportation is. This is due to the large amounts of petroleum used in creating ammonium nitrate fertilizer (for the corn they are fed) plus the cost of shipping that corn to the cattle and then shipping the cattle to slaughter and grocery. If one eats meat it should always be from a local source. Choosing vegetarian foods also drastically reduces agricultural water consumption and land use, and favorably impacts biodiversity. Vegetarian diets have been shown to promote good health and in most developed countries, eliminating meat from one's diet is as easy as making responsible choices at stores and restaurants. Other factors such as the means of production and distance food travels can also influence the total impact of our food choices. Recycle more by using recycling bins, composting, etc. Encourage neighbors, supervisors, colleagues, and businesses to do likewise (15-25% of people don't recycle). Use compact fluorescent bulbs. Replace three frequently used light bulbs with compact fluorescent bulbs and save 300 lbs. of carbon dioxide and US$60 per year. A standard compact fluorescent bulb will save around one third of a tonne of greenhouse gas, along with the cost of six or more incandescent globes. Consider using even more, and give them as gifts to family and friends. Donate a set to a local charity to refit their office with compact fluorescent lights. Remember, CFL bulbs do contain small amounts of toxic mercury. Therefore, proper disposal (recycling) is necessary to prevent any additional landfill contamination. Use recycled paper. Make sure your printer paper is 100% post consumer recycled paper. Save 5 lbs. of carbon dioxide per ream of paper. Decide if something is really worth printing out. Leave a signature at the bottom of your e-mails reminding the reader to think twice before printing the e-mail. Make the most of scrap paper for shopping lists, notes, scrapbooks, phone messages, taking notes in class, etc. Only recycle your paper when it has been thoroughly used up! Buy locally made and locally grown products. Buy locally to reduce the energy required to transport your goods. The consumable products we all purchase represent over half of the average family's carbon footprint! If you successfully encourage neighbors to do this, store owners will be encouraged to stock local goods. Shop at farmers' markets. Count your carbon. Keep track of your carbon consumption as a way of tracking your progress. There is a logo called Carbon Counted that companies can put on their products to communicate their carbon footprint. Buying products that have a low Carbon Counted footprint number gives consumers a means by which to influence and reward companies that reduce emissions in the creation of their products. Support producers of renewable energy. Help spur the renewable energy market by participating in it. In the UK you can get 100% renewable electricity by switching to a company such as Ecotricity or Good Energy Ltd. Or you can do so by buying wind certificates, green tags, and stock in renewable energy companies. Many of these companies are new and small and the stock is low in price. While many are high-risk, they may present an opportunity to help the company move beyond the initial stages of uncertainty and to enhance the viability of important, upcoming market niches. These companies may offer opportunities for great returns if they prove profitable; just be sure to do your homework first, as you would when investing in anything. Buy minimally packaged goods. Less packaging could reduce your garbage significantly, saving 1,200 pounds of carbon dioxide and $1,000 per year. If you consider a certain products' packaging to be excessive, mail it to the company with your challenge to the company to reduce its packaging; include suggestions on how if you have ideas. And while you're at it, feel free to let companies know that if Wal-Mart thinks reduced packaging is not only a good idea but very achievable, then this is likely to set the standard for many businesses in the future. Insulate anything that uses energy to stay a different temperature from its environment. Keep your water heater insulated to save up to 1,000 lbs. of carbon dioxide and US$40 per year. Don't use units fitted with continuous pilot lights and you will save AUD$40 and 200 kilograms of greenhouse gas emissions yearly. Also, use less hot water. For example, if the shower is too cold, don't turn up the hot water but turn down the cold water. Be energy wise and insulate your entire home to keep down the heating and cooling costs. If your insulation is old or inefficient, do yourself a favor and replace it; not only will it reduce your output of emissions but it'll reduce your energy bills considerably. Consider the attic, crawlspaces, basement, walls and ceiling. If you have awkward spaces, don't forget that cellulose or fiberglass insulation can be blown in by a professional contractor. Weather strip your home. Caulk and weather strip your doorways, windows and air conditioners. Save 1,700 lbs. of carbon dioxide and US$274 per year. You will discover that the costs of caulking are far outweighed by savings in fuel costs and increased comfort level. Replace old appliances and reduce reliance on them. Inefficient appliances (such as refrigerators, washing machines, and air conditioners) waste energy. Save hundreds of pounds of carbon dioxide and hundreds of dollars per year by replacing them (and having your old appliance recycled or disposed of properly). Many countries have "energy star" ratings on new appliances that allow you to assess the energy usage of the appliance. You may even be able to check online before you go shopping, to save time. If this isn't an option, at least check the seals on your fridge or freezer and replace them if they show signs of wear. While you're at it, reassess appliances that you really do not need to use, such as plug-in air fresheners. Try opening the windows instead (and throwing out that rotting fruit bowl) and replace with natural air freshener alternatives. Other items include the many so-called time-saving devices in your kitchen. Use a push mower to mow the lawn. Use your muscles instead of fossil fuels and get some strength-building exercise. Save 80 lbs of carbon dioxide per year. Unplug unused electronics. Even when electronic devices are turned off, they use energy. Save over 1,000 lbs of carbon dioxide and US$256 per year by unplugging them or switching them off at the wall using a power surge-protector (sometimes called a power center). Get into the habit of switching the power off before you go to bed. Grow fast growing plants. Plants like bamboo grow faster and produce 35% more oxygen than trees like oak or birch, and require fewer chemicals and care. Make sure that the plants are appropriate for your area; prefer native over introduced species and do not plant problem species. Bamboo, for example, can be very invasive in most of the US. Use public transportation. Taking the bus, the train, the subway or other forms of public transportation lessens the load on the roads and reduces one's individual greenhouse gas emissions by an average of 1600 pounds per year. Taking public transport removes the stress of long road commutes and gives you a great opportunity to read, think, and relax. You also save on parking money and time wasted looking for parking spaces. Ride a bicycle. Taking the bike instead of the car is a very simple solution. However, if you experience such problems as lack of suitable bike paths, having to deal with congested traffic or hilly terrain, you are faced with a few challenges. They are, however, challenges that you as an individual can overcome with a little determination. Ask your local government to make (more) bike trails in your area and to make sure that bicyclists are kept safe from traffic in the same way that pedestrians are afforded this right. Get the local community behind you - a few neighbors, the street, or the whole suburb! If you have hilly terrain, there are solutions as well. Build up your strength with shorter trips, find alternate routes, or take a bus part way (many municipal buses have bike racks on the front that you can use). Use your vehicle as a tool against global warming. If you can't live without a car, then use it in a way that minimizes global impact. Buy a hybrid car. The average driver could save 16,000 lbs. of CO2 and $3,750 per year driving a hybrid. Plug-in hybrids can save even more and one day may be able to give cash back. Buy a fuel efficient car. Save up to 20,000 lbs. of carbon dioxide per year using a more fuel efficient car - that's a savings of AUD$10,000 over a car's lifetime. Buying fuel efficient cars also encourage companies to continue making and improving them owing to increased demand. Practice green driving. Save gas and lower stress levels by being a considerate driver. Improve fuel efficiency by removing unused external objects such as roof racks, turning off your engine instead of idling for long periods of time (over 1 minute), and removing loads from the trunk/boot that are not necessary. Change your air filter. Check your car's air filter monthly. Save 800 pounds of carbon dioxide and US$130 per year. Cleaning your air filter improves your mileage and reduces pollution because it makes it easier for your car to take in air and maintain a proper fuel/air mixture. Use Refills. Try using refills instead of buying new jars or bottles each time. This reduces your consumption and is usually cheaper, too. Even if we as humans are not fundamentally creating global warming, these steps will help reduce many types of pollution and waste and help ensure that clean air and water will remain for future generations. Companies can take immediate action to help with this effort by virtualizing their workforces to reduce, or even eliminate their employees' commute and help reduce automobile pollution. Try to use more tap water and to cease usage of bottled water. Doing so will reduce the energy costs of bottling and transporting water. Take responsibility for your office's energy use. Many offices leave air conditioners, computers and lights running all night. Work with responsible parties in your company to turn off or use power-saving features on these devices when possible. Planting trees balances carbon emissions and pollution. There are organizations that will help you offset your carbon footprint. Keep in mind that not every scientist believes man is responsible for all or most global warming and some are not even sure that it is happening. Many believe that global warming is a natural occurrence with our earth, but it's still a good idea to keep your energy use to a minimum.